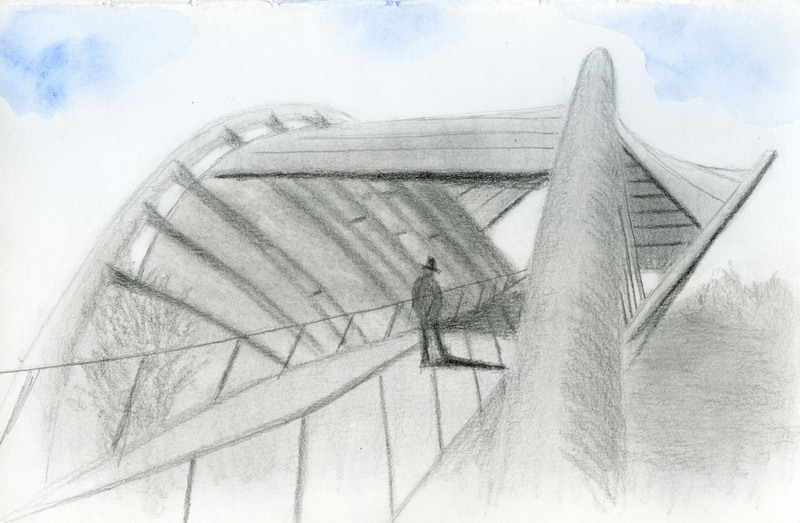 These are the papers I've been testing with graphite. A few weeks ago I concluded that my long-time favorite sketchbook paper, 140-pound Canson XL watercolor paper, wasn’t going to work with the graphite techniques I’ve been practicing since I learned them from Eduardo Bajzek in Porto. While it’s ideal for my needs with water-soluble colored pencils, ink, brush pens and markers, the cold press finish is too toothy for graphite, especially when it’s smudged. 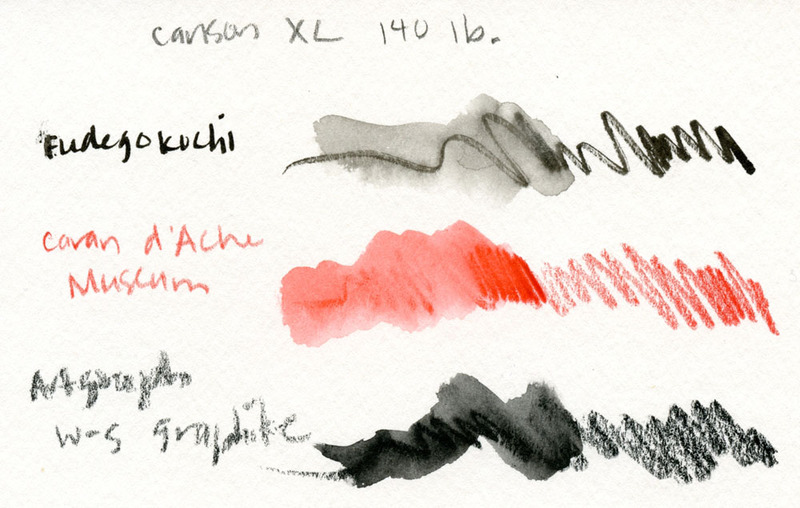 Since then, I’ve been experimenting with a bunch of different types of paper I have on hand. The paper must be satisfactory with graphite and also satisfactory with other media I use most often. To be satisfactory with graphite, the surface must be smooth enough to smudge with an even tone and erase easily (two essential techniques with Eduardo’s method). To be satisfactory with my other favorite media, the paper must be able to withstand at least a light spritzing of water (a technique I employ often with water-soluble colored pencils). 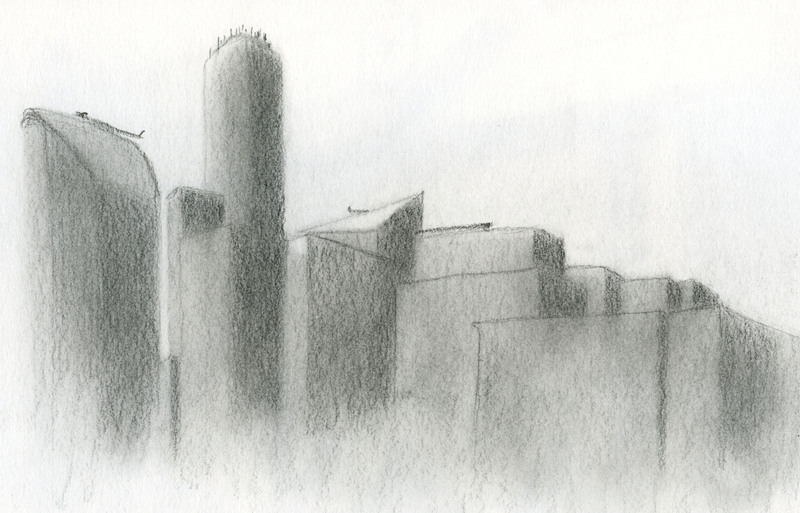 In fact, ability to withstand moisture is also a requirement with graphite because the spritzed-on fixative I’ve been using causes thin papers to buckle irreparably. 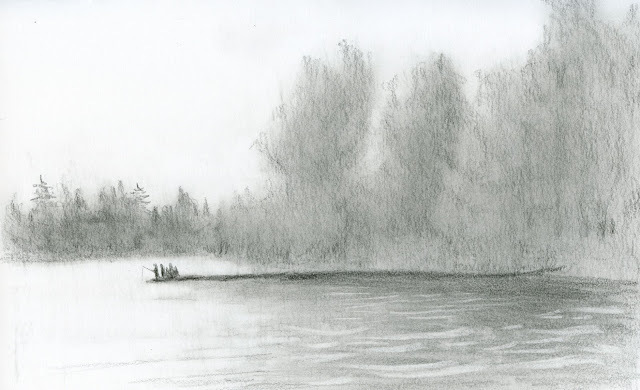 The short story: No single paper is going to make me happy with all the media I want to use in the way that 140-pound Canson XL made me happy for years – until I introduced graphite into the mix. The long story: Many papers that are excellent with graphite make me unhappy (some very unhappy) with most of the other media I like to use. At least two papers were easy to reject. 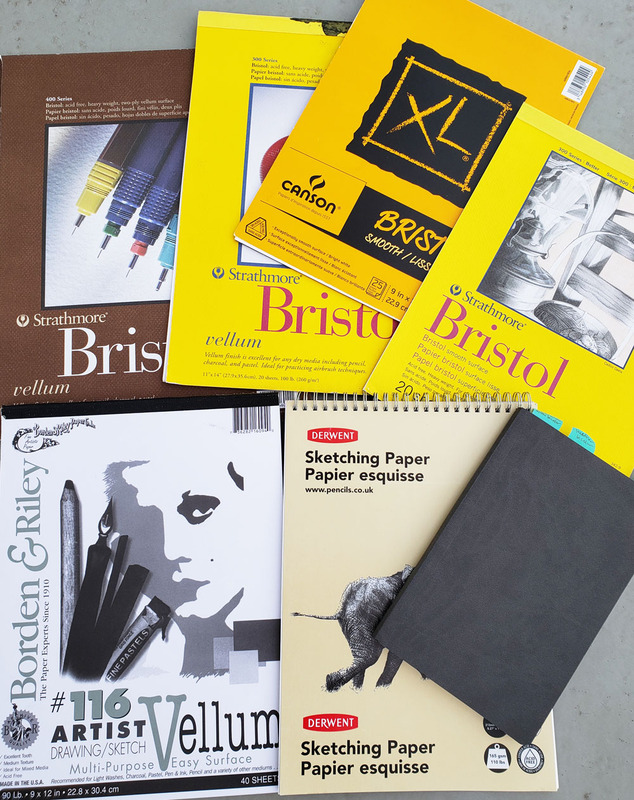 The first was the Derwent sketch pad that I received at the symposium and used in Eduardo’s workshop. While its tooth is acceptable with graphite, it’s difficult to erase and too thin for use with any liquid media. I was also quick to reject Borden & Riley vellum, which is also too light to use with anything but dry media. It is the only paper I tested that did not accommodate Faber-Castell Pitt Artist Pens; the ink sunk straight through the sheet and continued to bleed onto the next page. The Derwent sketch pad is difficult to erase cleanly. The Bristol vellum papers, with an acceptable tooth, are more difficult to erase, so I rejected them, too. 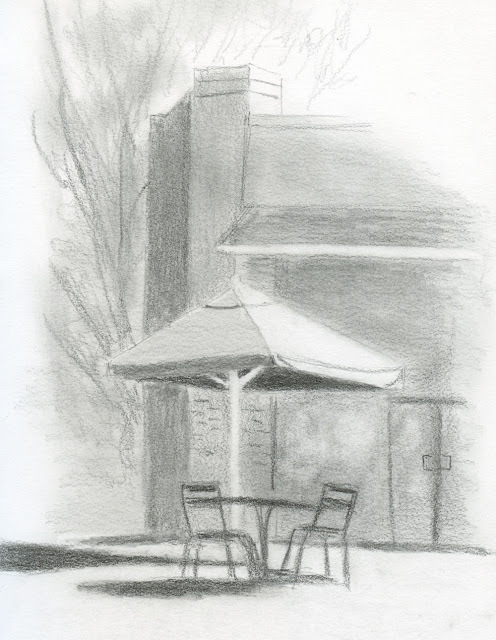 My favorite papers with graphite – especially with the smudging/erasing techniques – are Bristol smooth (both Strathmore and Canson) and Stillman & Birn Epsilon. 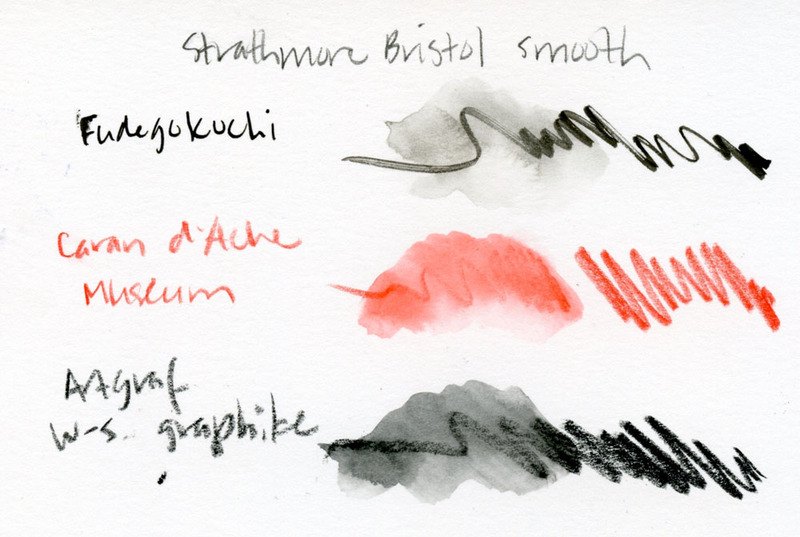 The surfaces on all three are pleasantly smooth but have just enough texture to take graphite beautifully. They also erase easily. The big – huge! 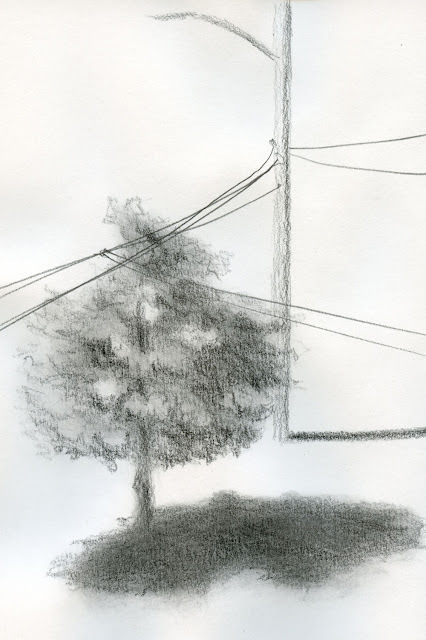 – issue with all of the above graphite favorites is that they are not sized appropriately for wet media, even if they are sufficiently heavy in weight. (All are about 100 pound in weight, which buckles when wet but flattens out adequately after drying.) For example, dry colored pencil applies as well as graphite does, but when I spritz or brush water-soluble colored pencil pigments with water to activate them, the pigments do not spread as easily, and the hues seem less vibrant. In addition, once the activated pigments dry, the paper surface changes in a way that additional layers of colored pencil do not apply well. This is a major drawback in terms of achieving intense hues with watercolor pencils. 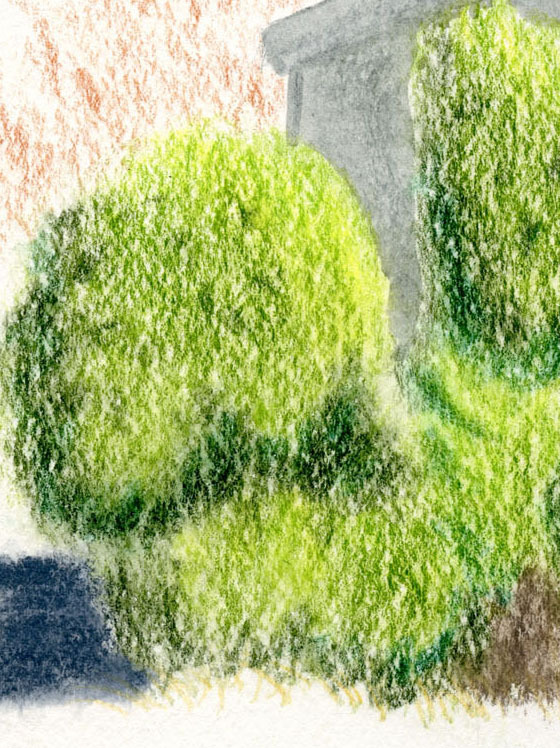 In most of my watercolor pencil sketches, I also miss the texture that I enjoy with Canson XL’s 140-pound paper. An equally disappointing result is the way water-soluble inks perform on Bristol smooth papers. 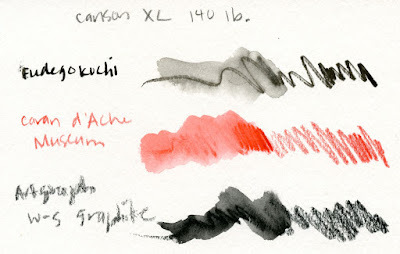 On my favorite Canson XL watercolor paper, I am accustomed to easily shading such inks with a quick swipe of the waterbrush. A few days ago at the farmers’ market, I was using a water-soluble Kuretake Fudegokochi brush pen to sketch people sitting in the grass. 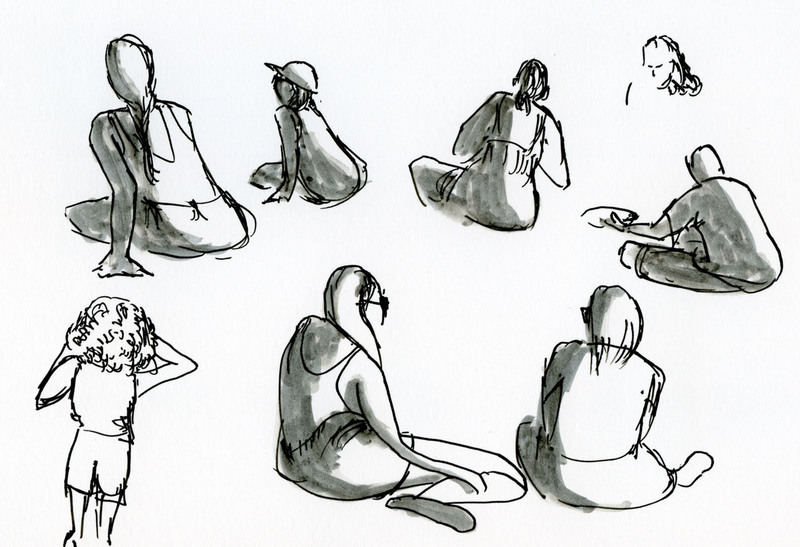 As is my habit, I grabbed a waterbrush to wash the lines – and the lines barely moved. I kept squeezing out more water, thinking that the brush was dry, but to no avail. I finally took out a Pitt marker to add shading. I couldn't get the water-soluble Fudegokochi ink to move on Strathmore Bristol smooth. 1. The most obvious solution seems the simplest: I always stitch my own sketchbook signatures anyway, so why don’t I simply bind together a mix of papers – some for graphite, some for everything else? It’s one of the biggest benefits of hand binding – I can use any papers I want. It does sound simple – except that I like to keep my sketches chronological, and how do I know which medium I want to use when I get to a particular type of paper in the signature? 2. If I’m willing to give up chronology, I could carry two signatures – one with my favorite Canson watercolor paper; one with a Bristol smooth – which would be less confusing and preferable to paging through a signature of mixed papers to find the appropriate page. But that would mean carrying more paper. 4. I could do a variation of No. 3 but only for a limited time, such as the minimal sketch kit challenge I gave myself last winter. A plan like that would enable me to keep my sketches chronological and have the benefit of lightening my load. Now that I’ve embraced fall, I absolutely must have color in my bag through November, so I’ll be switching back to 140-pound Canson XL at least for that duration. Maybe I’ll also carry a thin signature of Bristol smooth for occasional graphite sketches and see if I can tolerate the broken chronology. Then during the gray winter months, perhaps I’ll go on an all-graphite diet.